WeatherTech Side Window Deflectors are precision-machined to perfectly fit your 1998 Hyundai Sonata's window channel. These low profile window deflectors help to reduce wind noise and allow interior heat to escape. Our light tinted Side Window Deflectors are the only deflectors in the world made with a D.O.T. (U.S. Department of Transportation) approved glazing material. Available in light and dark tint for most vehicles. Designed and Engineered in USA – Handcrafted in Germany. With the window rolled down 1/2", use to have a god-awful whistling sound from wind noise. With these deflectors, NO MORE! Also, with a driving rain, I dont get pelted on the side of the head anymore. You're darn right I'll buy these again. Summer heat can raise cars interior to unbearable tempatures in our area. 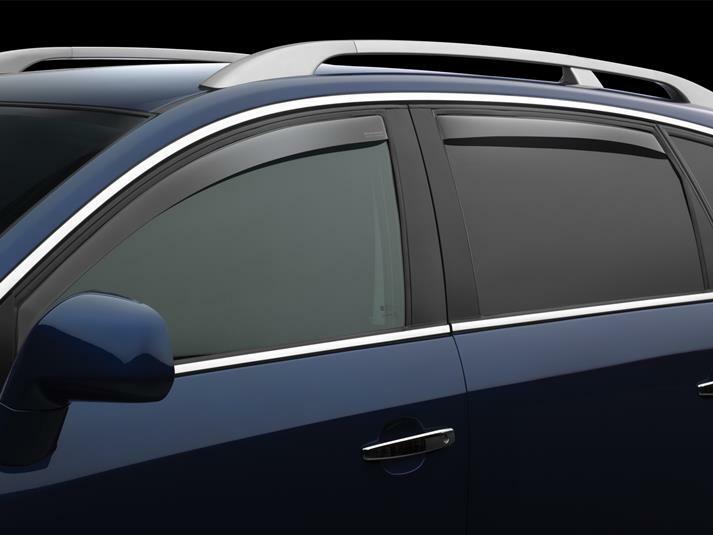 Weathertech's side window deflectors have been a life saver in reducing the cars heat during the summer. An additional plus is slightly lowering the windows eliminates windshield fog on cool or rainey mornings while preventing rain from entering. This is the fourth car I have equipped with Weathertech side window vents and the improved car look is only exceeded by the functionality of the product. Tried cheaper deflectors from another vender on a previous vehicle was always tring to stick them back on they would come losse on the highway frequently. These Weathertech vents install easily and stay in place. Much better product. The first thing I always do when I get a new car is put some side window deflectors on them. Previously I had always used those "stick-on" deflectors with mediocre results. A deflector was always coming loose with no real solution except to completely remove all adhesive & try again. Then I found WeatherTech and their in-channel side window deflectors. No more loose deflectors or whistling wind noises! These are the best deflectors EVER! Due to the high quality of this product, I will only purchase from WeatherTech in the future. I liked the ease of the installation of the deflectors and I like the feeling of security of the in channel installation rather than the stick on because we had a different set from another company that blew off the car while traveling. I would like to thank your rep who helped adivse me as to how to install them.